More buyers are opting for adjustable-rate mortgages in order to cut costs amid rising interest rates, new data from CoreLogic shows. They’re doing so even as the potential savings between a fixed-rate mortgage and an ARM get narrower. According to Freddie Mac data, the average rate on both a 30-year fixed rate mortgage and a 5/1 ARM has jumped by 70 basis points from August 2017 to August 2018. However, ARMs still typically provide a slightly reduced initial interest rate before rising after a set period, usually five or seven years. ARMs are more popular in the most expensive metro areas, and with buyers that borrow larger balances on their loans, CoreLogic’s Archana Pradum said in a blog post. “As ARMs have a lower initial interest rate than [fixed-rate mortgages], buyers see bigger monthly savings in the initial payment, especially for bigger loans,” Pradum wrote. The share of ARM mortgages is biggest in areas such as San Jose, which currently tops the list of average sales prices in the U.S. The metro area had the highest share of ARMs in 2018, CoreLogic said. In total, ARMs accounted for 51 percent of the dollar volume among mortgages of more than $1 million that were originated during August 2018. 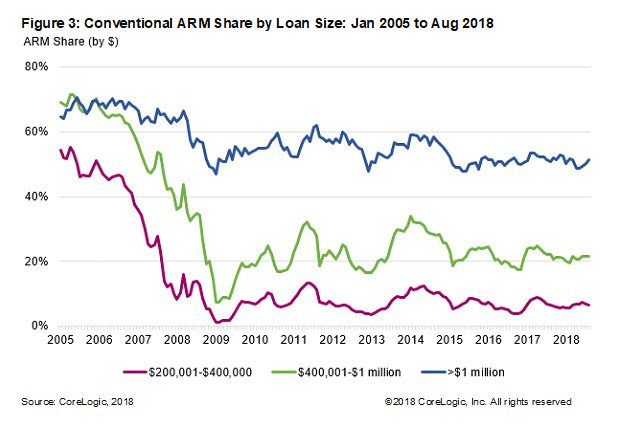 Among mortgages in the $400,001 to $1 million range, the ARM share was about 21 percent, and in the $200,001 to $400,000 range, ARMs accounted for just 7 percent of the mortgages. As of August 2018, ARMs comprised about 15 percent of the dollar volume of conventional single-family mortgage originations. The ARM share has remained relatively stable since 2010, but has risen in some geographic areas and at certain higher price points. ARMs earned a bad reputation during the housing crash when homeowners faced resets from their initial interest rate and could no longer afford their monthly payments. The ARM share was more than 50 percent during mid-2005 but then dropped to a low 4 percent in early 2009. Stricter underwriting requirements from lenders in recent years may have discouraged ARM volume from taking off again, CoreLogic notes.